It’s Walking the Dog Day! Have you noticed all these special dog days on the calendar? Just Friday we celebrated Love Your Pet Day, and now here it is Walking Your Dog Day! It’s Walking Your Dog Day! How are you celebrating? Studies indicate that as many as 40% of owners do not regularly walk their dogs. There are any number of reasons why. Earlier this week I touched on a problem that us dog walkers have with unleashed dogs when walking our beloved companions. Other reasons include a lack of training for dogs that results in problematic behavior. Many “experts” identify the underlying problem as laziness on the part of the owner. I disagree. I think the underlying reason is fear. We’re afraid something will happen to our beloved dogs. We’re afraid of our beloved dog’s behavior. We’re afraid of the behavior of others. And, let’s be honest, many towns don’t invest in animal control, so there are few incentives for the bad actors to clean up their act. Are you afraid to walk your dog? It’s OK to admit it. It’s time we all faced our fears, if not for ourselves, then for our beloved dogs. A walk for a dog is stimulating not only for the body, but for the mind. It’s all about the smells, right? The sniffing out pee-mail and responding in kind? The sniffing of objects to discover if it was a human, or cat, or squirrel that crossed this path before we did? And it’s not only about your dog. Humans who walk their dogs regularly, on average, get more exercise than those that don’t have dogs. Walk with friends. Grab up another dog owner and walk your dogs together. It will lessen the likelihood you’ll chicken out if someone else is depending on you. Work with a trainer. Yes, it does cost money, but if it’s fear keeping you from enjoying a walk with your dog, then it’s worth the investment. You can work on those problem behaviors such as pulling, snarling, and the like. Don’t feel comfortable walking in your neighborhood? 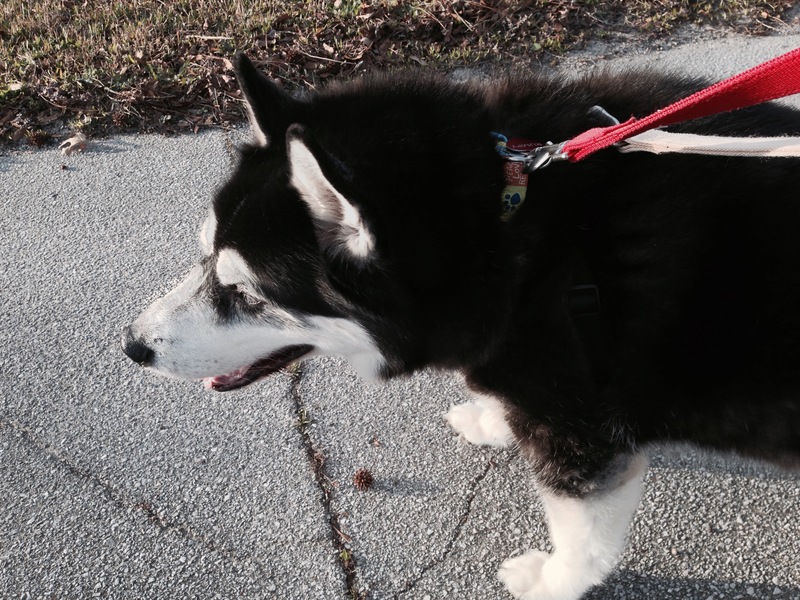 Find a walking track where dogs are allowed on-leash only, and walk there. If you see dogs off-leash, report them. Even towns with the laxest of animal control want to keep the designated dog-walking areas safe. Look, I’m the biggest worry wort in the world, and if I can overcome my fear and walk my dog, then so can you. So how about starting today? « Happy National Love Your Pet Day? WTF? Wow! That is such a wonderful thing for your husband to do! Hooray for him! Walking with your dog gives us lots of pleasure, like finding a new road, meeting a new people and giving us good exercise. Of course, if it rained, we sometimes felt like not to go out, but mostly we enjoyed it together ! I have met many of my neighbors through walking Rumpy. It’s a great way to stay connected! Due to the nature of Forrest and Doc we walk here around the property..11 acres of critter sniffs and peemails..and sadly roo poo which is a treat apparently..ewwwww but i know they are getting great exercise and no fear of attack..the roos and rabbits get them stirred up ad they sleep running and chasing them in their dreams.yes i fear walking them out due to off leash dogs.. I understand, but at least you are in a position to walk them in a place that’s safe. Off-leash dogs are a big problem for dog owners, and I think as we become a society that treats dogs more like children, that problem is going to have to be addressed. So agree and the whole reason we moved here was that and a person who decided to shoot and kill our cat…made sure we had space and safety…we are lucky we could do this for them all. Maybe February is Dog Month which is why we are having these ‘special days’. Still, we have participated (as we do every day!) and have one very tired mutt curled up on the bench after her second walk of the day. Besides, walking a dog on a regular basis is a lot cheaper than joining a Gym! And a lot more fun for both of you! we walk together every day, it’s good for easy and good for me. I agree with you, it’s sometimes not easy to find an area to walk a dog…. It’s not easy, but I think one thing that’s helped curb the bad actors in our neighborhood is seeing Rumpy out walking. He looks fearsome, so the bad actors aren’t coming out when we do. I hope that trend continues. I’ve also been helpful for Jen in pointing out the people she shouldn’t trust. If I don’t like you, that’s not a good sign. Walking is he best fun. When Mom had a sore knee and needed surgery, our walks were really short, but she said if it weren’t for me, she’d have sat on the couch and never moved again as long as she lived. I saved her life! Now we walk faster and farther and stronger than ever. We LOVE walking. You’re welcome, Mom…. And you’re services were more fun and less expensive than physical therapy! I had the nicest walk with Loup last night in the falling snow as the family went off to Montreal so I said I’d look after things. It was nice and quiet without too many cars and no other people with dogs around. I must admit it can be scary walking him sometimes if we meet up with someone walking another dog. He is very strong and can really yank and he loves to fight if provoked. Still, when there’s no one around it’s great! I got lots of exercise last night as he was really pulling and I had to run to keep up. He is good for getting me out to exercise. Very true. Rumpy sometimes pulls me, and we have non-verbal arguments over who is in charge. We walk Spot 1-3 times a day and we have been taking Link along and he’s just over 9 weeks old. It breaks my heart when we walk in our area because at almost each fence I hear and see dogs, large breed dogs, who would love to join us and probably will never see the outside of their yard unless they bust out (which they often do and I am the one they come to!) Cesar Millan is the one who taught me a lot about “the walk” but before him was our first dog Sam who showed us how vital it was. We met people and other animals we would have never met. We saved dogs and other animals because of our walks. Walks are not just for the dogs but for people to see what’s really going on in their world. Excellent point! I knew there were homeless people in the area because the shelter is about 10 blocks from here, but we now see evidence of places where homeless people have spent the night. In one doorway we found an empty pack of smokes and a New Testament Bible. Now each time I walk by that spot, I wonder about the person that spent the night there and if they’re OK.
May be some time they will still be there and they can meet Rumpy 🙂 Sam use to love to come up to folks like that and love on them. The smile a dog can bring to a tired, lonely, sad face is a treasure. My moms walk the furry beasts every day, but have had a few scary run-ins. Once my five-pound sister Eggnog was attacked by a much bigger dog that wasn’t on a leash. Other than being terrified, luckily she walked away unharmed. It’s sad that so many dogs are injured while involved in law-abiding activities, while the bad actors face few, if any, consequences. I love dogs but I don’t have one simply because we are gone most of the day and I do not have the time to walk a dog as much as they deserve. I know people who crate their dogs to protect their homes from bad behavior while they are at work and I would rather be dogless that subject them to that. It’s good that you’re realistic enough to know what your limitations are. Ray ……………… being Ray …………………. would (I suspect) be quite a challenge if he wasn’t walked regularly so to answer your question – he gets walked daily, regardless of the weather! We let him decide whether it is a long (2hrs or so) or short (30-45mins)walk. I have learned so much about him simply with walking him, and I believe that he has learned so much about me that our relationship has grown accordingly. I feel sad for those dog owners who never take the time to get to know their dog. They are missing so much! It has enhanced my relationship with Rumpy. Now that he’s the only dog, he and i have grown closer. Come back Tuesday. That post is all about cats! Right on and ditto about the worry wort thing, but hey can’t let fear paralyze us/and our fur babies. My hubby, bless his sweet heart walks all three of ours just about every day, separately. Good for them and great for him. Rumpy sure looks content on that red leash. ❤ Happy Sunday ya'll. 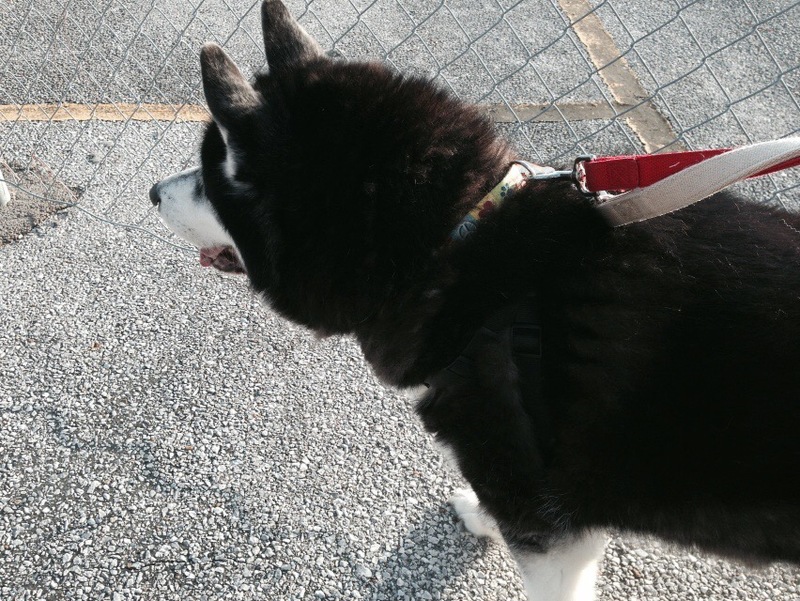 That leash was a gift from Leslie, @SiberianForrest on Twitter. She sent Rumpy and DeDe each a leash and collar with personalized tags. Aww, that is so sweet she gifted those to you. Going to follow her on Twitter. Thanks! We take a longish walk every morning. I have to carry mace and my camera with me. The other dog walks are not as long. They humor me by walking a few times a day. I enjoy walking by myself. It is more fluid. I try to get 10 miles in every day. I have my nano loaded with books and it makes the walks pleasurable. I usually do the 10 miles over two or three walks. Living in Florida makes it possible. Wow! You are very fortunate! How about this? We are old, arthritic, and live in a rural area with no sidewalks or parks. The dogs have a great big yard and a doggy door for constant free access and egress. They seem pretty happy with it. The one dog we have too old to get up and down the stairs gets carried via personal slave several times a day up and down the stairs because it’s the only way we can keep her. Well that does make a difference! We do have to watch where we walk because of all the stupid peeps who don’t control their dogs very well, but we sure do LOVE our walks. We usually get to go at least once a day as along as there isn’t any slippery ice around. We’re lucky that since we live in Florida, there’s almost never any ice. Sometimes it rains hard and I don’t go because I don’t like to get wet. But Jen said she was willing to go with if I’d only go. Loved your blog and you made points well taken. I can no longer walk my dog because I am disabled, but he does regularly exercise in the back yard and is well trained. I am looking forward to my granddaughter getting a little older so she can take Guiness for short walks (he’s a senior, himself). It’s good you provide a way for your dog to get exercise. I sit out with him while he runs around our large back yard and also socializes with the cats. Really? People don’t walk their dogs? That is just wrong!